Pune-based processed food maker Adinath Agro Processed Foods Pvt Ltd has raised an undisclosed amount in its first institutional funding round led by private equity firm Carpediem Capital. Carpediem has acquired a significant minority stake in the company, which offers its products under the brands Surabhi, Winn and Magic King. Infina Finance Pvt Ltd, a firm that houses a hedge fund and is jointly controlled by Kotak Mahindra Bank and its promoter Uday Kotak in his personal capacity among others, also participated in this round. The company will use the money for expanding capacity and increasing distribution reach, as per a press release. "We have been growing over the last few years and fortunate to find the right partners in Carpediem Capital and Infina Finance, who have the right mix of financial and operational expertise," said Rajesh Gandhi, director, Adinath Agro. Established in 1989 by Gandhi and his brother Nitin, the company manufactures sauce, fruit jam, fruit crush and syrup, Chinese sauce, canned fruit and vegetables and fruit pulp. While Rajesh had earlier worked with the food division of Blow Plast and All Seasons Foods Ltd, Nitin was associated with James Smith & Co, which was acquired by Marico Industries. "The company is a leader in the niche category of Jain sauces, which is seeing double-digit growth due to increased penetration in Tier II and III markets,” said Hithendra Ramachandran, MD, Carpediem Capital. “Adinath Agro can emerge as a regional leader in the value segment of the market which is not well served by MNCs and larger Indian brands,” said Venkat Subramanian, CEO of Infina Finance. According to Infina Finance, the processed foods sector is poised for high growth in coming years on the back of increasing number of nuclear families with a higher share of working women and rising disposable income of Indian middle class families. 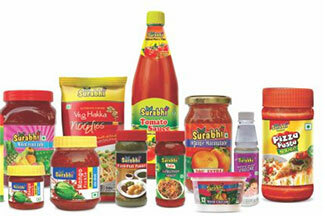 Another major player in the space is Mumbai-based Nilgai Foods Pvt Ltd. The company has recently shut doors of its restaurant business, making its traditional gourmet food products the prime focus of its growth plan. Carpediem has recently backed Gurgaon-based Thea Kitchen Pvt Ltd, which runs quick service restaurant (QSR) brand Biryani Blues. The PE firm’s focus sectors include consumer products and services, healthcare, consumer finance services, logistics, managed services and education and its investment sweet spot is Rs 15-50 crore while bringing in co-investments for larger deals. Set up by executives associated with PE firm India Equity Partners and its portfolio companies, the PE firm is looking to raise Rs 550 crore in its maiden India-focused fund Carpediem Capital Partners Fund I, including a green-shoe option of Rs 225 crore.